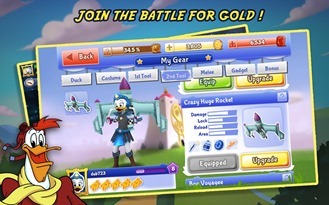 A new DuckTales adventure begins in this all-new quest for gold! Jump into mounds of riches with this exciting, online treasure-hunting game! The infamous Beagle Boys have swindled Scrooge’s fortune! It’s up to you to join the citizens of Duckburg to recover his stolen loot! Team up with your friends, and haul back the most riches to beat the competition in this mad gold rush. Get ready for a ton of action-packed fun and appearances from classic DuckTales characters like Scrooge and his quirky pilot, Launchpad! 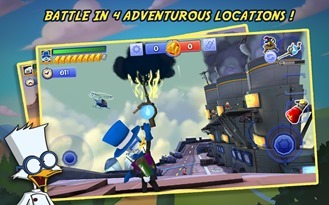 • THRILLING SINGLE AND MULTIPLAYER GAME MODES: Play with your friends, and face-off against the competition in the online multiplayer battle mode, or enter the single-player mode to complete important missions! • 4 HEROIC CHARACTER CLASSES: Adventurer, Inventor, Chef, and Pilot! Each class has different advantages, so depending if you value strength, agility, or intellect, there’s a class for you! 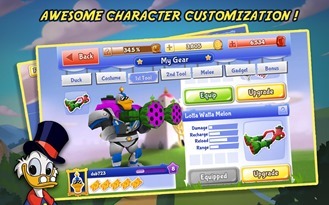 • AWESOME CHARACTER CUSTOMIZATIONS: Deck out your duck with cool outfits, tools, and gadgets. Challenge the other team with fierce spitball shooters, crazy rockets, plunger cannons, and other power-ups! • 4 EXOTIC ARENAS: Take the battle through ancient temples and caverns, and learn to master the different maps to gain an advantage over the competition! 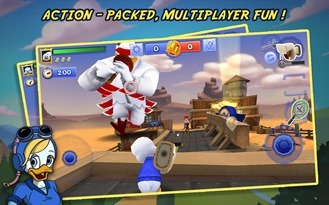 • MULTIPLAYER FUN: It takes teamwork to be the champions! Team up with your friends on Facebook or make new allies in the game to become the ultimate fortune hunters. • RULE THE LEADERBOARDS: Build up your stats in every match, and rise to the top of the ranks! 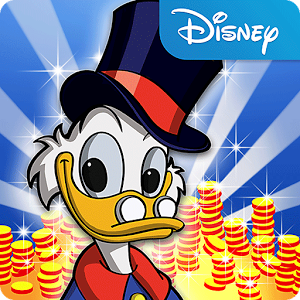 Let the games begin, and start playing DuckTales: Scrooge’s Loot, an official app from Disney! Get back into the action, and continue your DuckTales adventure with this all-new update! In addition to English, now you can play the game in French, Italian, German, and Spanish! We’ve also made performance improvements to make your battle experience even smoother. Compatibility: Requires iOS 4.3 or later. Compatible with iPhone 4, iPhone 4S, iPhone 5, iPhone 5c, iPhone 5s, iPad 2 Wi-Fi, iPad 2 Wi-Fi + 3G, iPad Wi-Fi (3rd generation), iPad Wi-Fi + Cellular (3rd generation), iPad Wi-Fi (4th generation), iPad Wi-Fi + Cellular (4th generation), iPad mini Wi-Fi, iPad mini Wi-Fi + Cellular, iPod touch (4th generation) and iPod touch (5th generation). This app is optimized for iPhone 5.